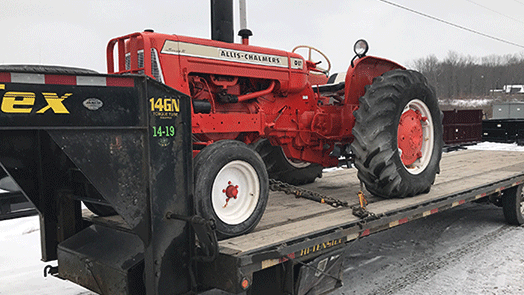 Tractor Transport has hauled hundreds of combines locally and cross-state. Whether your combine is operable or inoperable, Tractor Transport can haul it where it needs to be. Do you have farming and agriculture equipment in need of transport? Don't hesitate to contact us any day, from 8:00 AM to 9:00 PM. We're standing by waiting to help! Call the transportation specialists at Tractor Transport today, (877) 373-0109. 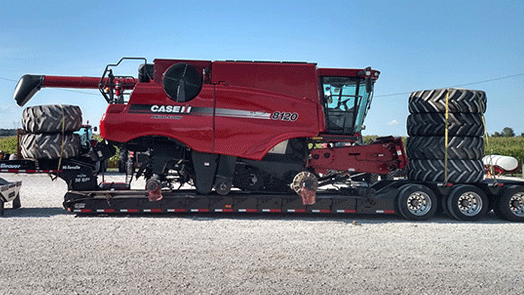 Tractor Transport recently shipped this CaseIH 8120 Combine from Goodland, Kansas, to Ivanhoe, Minnesota. The trip was 600 miles long through four states. Weight: 33,000 pounds. Length: 26 feet. Width: 11 feet 5 inches. Height: 12 feet 8 inches. 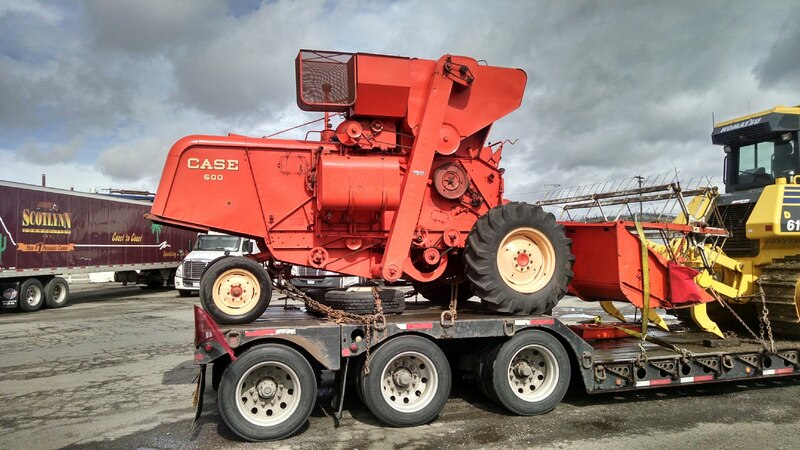 To haul your CaseIH combine to its next workstation, call Mike at Tractor Transport directly at (954) 603-2324. 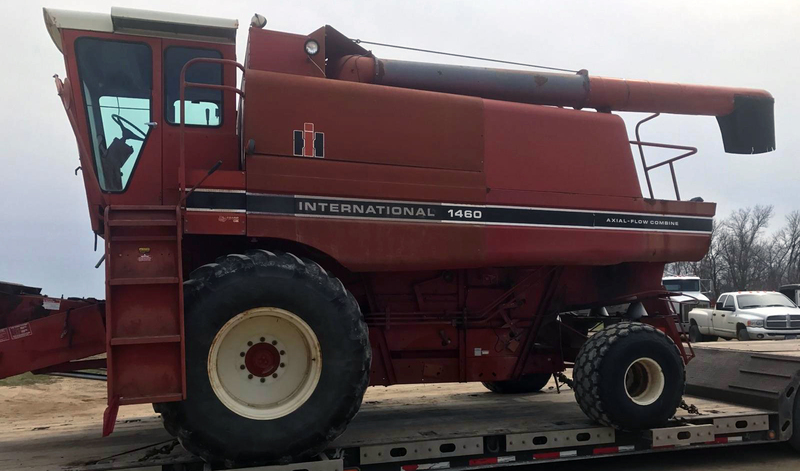 Tractor Transport recently shipped this 1980 International Harvester 1460 Self-Propelled Combine from Genoa, Nebraska, to Smithfield, North Carolina. The transport was nearly 1,400 miles long. Weight: 20,000 pounds. Length: 28 feet 10 inches. Width: 11 feet 6 inches. Height: 11 feet 9 inches. To ship your International Harvester combine, call Sam at Tractor Transport directly at (954) 703-1105. 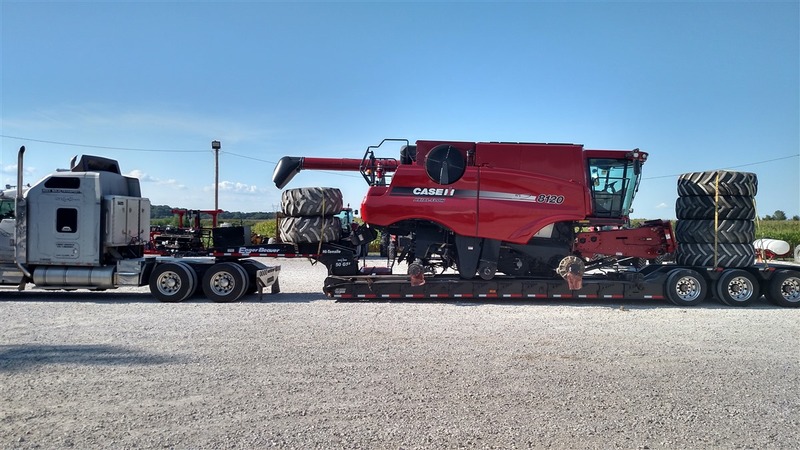 Tractor Transport shipped this Case 600 Combine from Watseka, Illinois, to Walla Walla, Washington. The trip was nearly 2,000 miles through nine states. Weight: 6,850. Length: 21 feet 3 inches. Width: 11 feet 6 inches. Height: 9 feet. 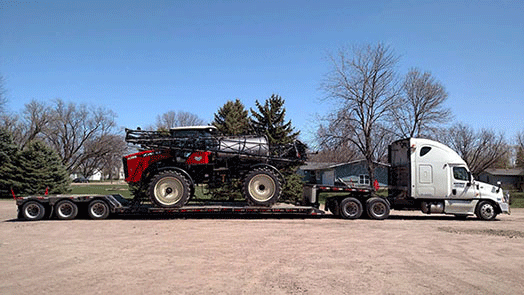 To ship your combine anywhere in the US, Canada or Mexico, call Mike at Tractor Transport directly at (954) 603-2324. 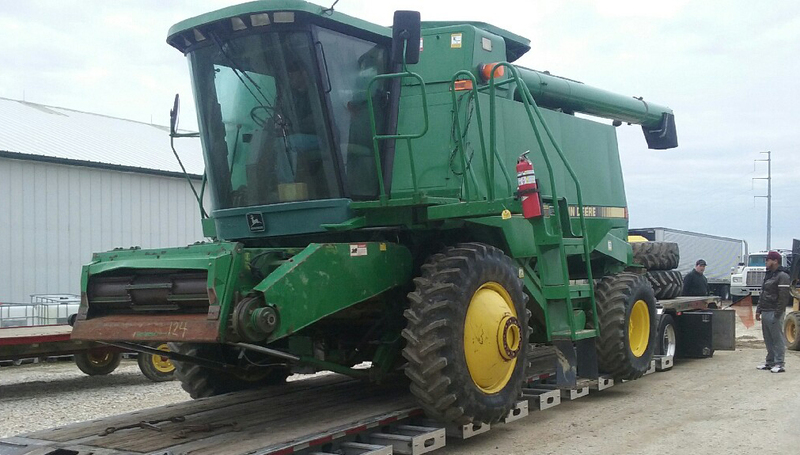 Tractor Transport recently hauled this 9870ST Combine from Pioneer, Louisiana, to Milbank, South Dakota. The trip was nearly 1,075 miles long. Weight: 31,000 pounds. Length: 36 feet. Width: 12 feet. Height: 12 feet. 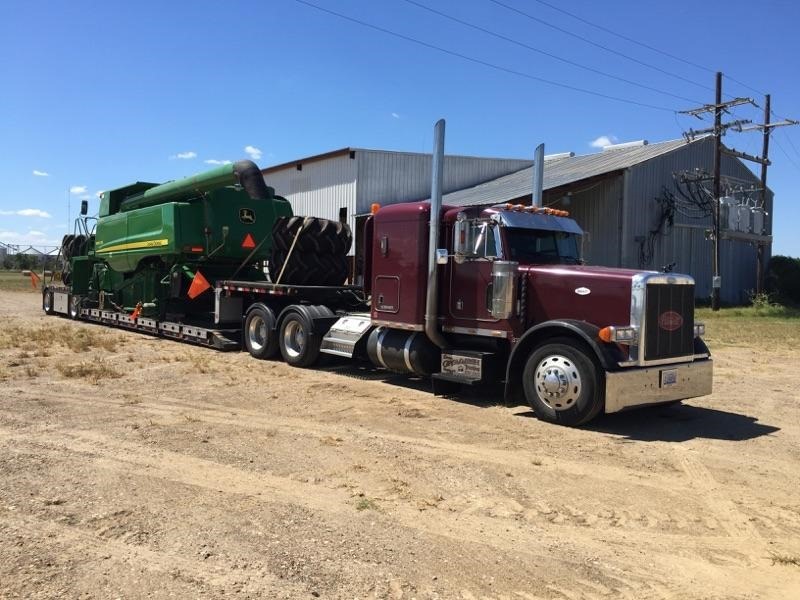 To haul your John Deere combine anywhere in the US, Canada or Mexico, call Brian at Tractor Transport directly at (954) 603-1344. 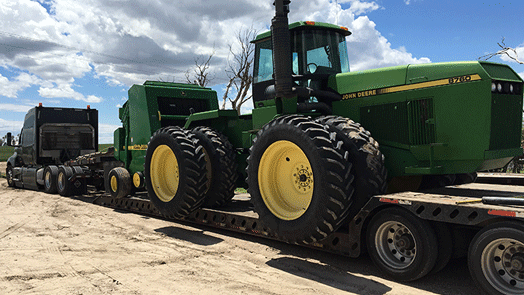 Tractor Transport recently transported this John Deere 9870ST Combine from Louisiana to South Dakota. The specialized lowboy trailer we used had a step-deck we used to haul the tires. To transport your John Deere combine anywhere in the US, Canada or Mexico, call Brian at Tractor Transport directly at (954) 603-1344. 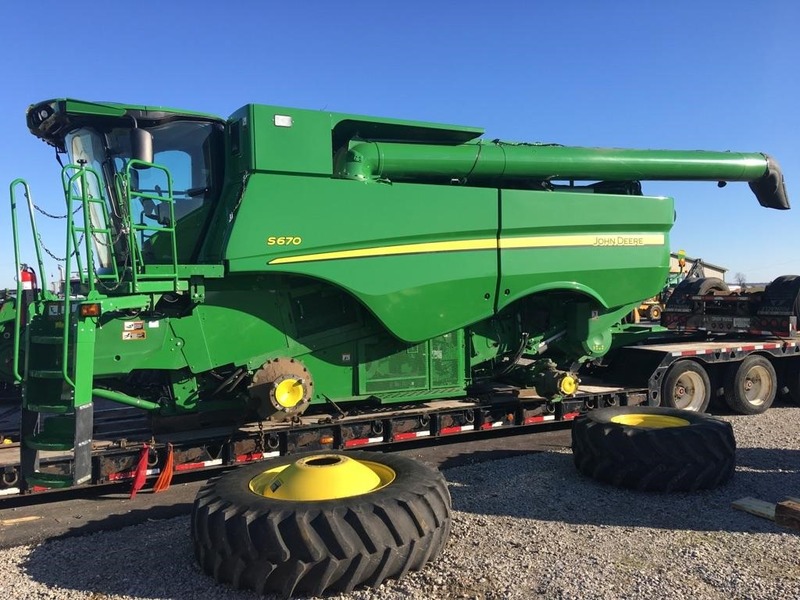 Tractor Transport recently shipped this John Deere 9870ST Combine more than a thousand miles as an oversize load. With the wheels removed, the client didn’t have to pay for overwidth permits. To ship your John Deere combine anywhere in the US, Canada or Mexico, call Brian at Tractor Transport directly at (954) 603-1344. 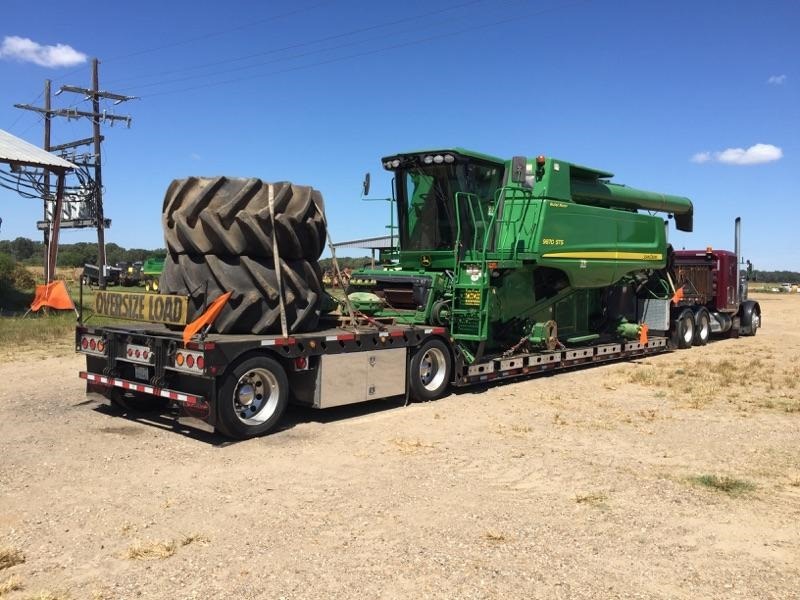 Tractor Transport recently hauled this John Deere 9770 Combine from Oelwein, Iowa, to Caldwell, Kansas. The trip covered more than 600 miles. The wheels were removed to remain within maximum width regulations. Weight: 37,000 pounds. Length: 35 feet. Width: 12 feet 8 inches. Height: 13 feet. To transport your John Deere combine anywhere in the US, Canada or Mexico, call Tye at Tractor Transport directly at (954) 839-8629. 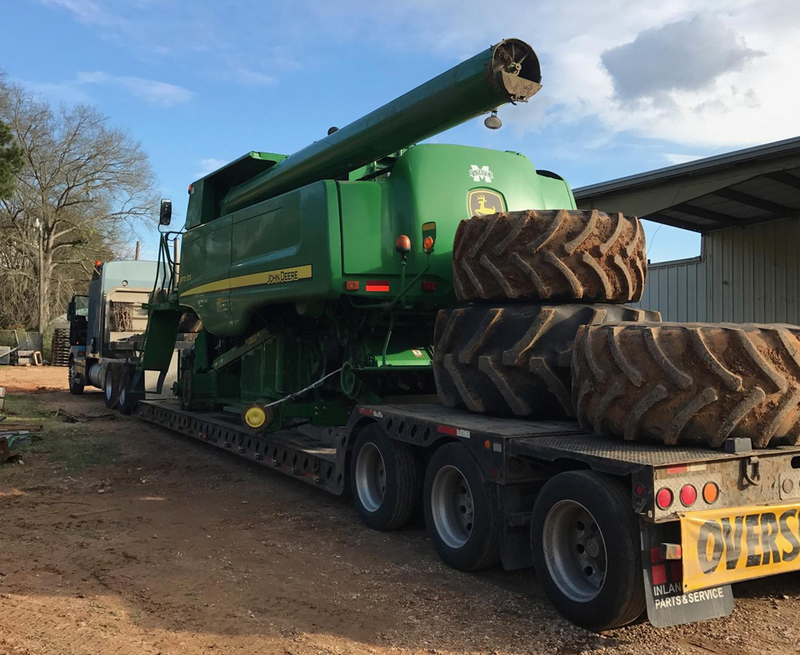 Tractor Transport recently shipped this John Deere 9770 Combine that weighed nearly 40,000 pounds. Notice how the extended trailer provided coverage for the auger, so there was no overhang. The extended deck also provided room to transport the tires in the same load. 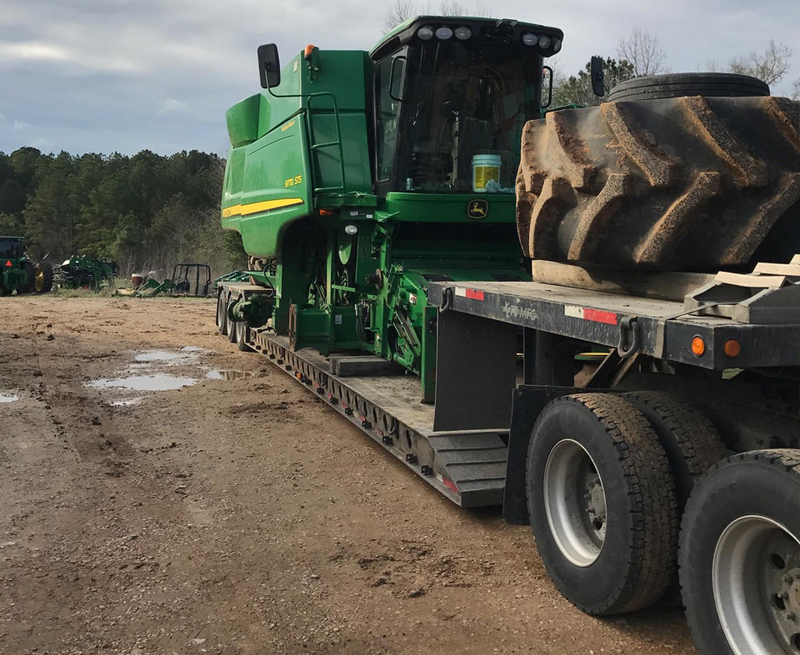 To transport your John Deere combine anywhere in the US, Canada or Mexico, call Tye at Tractor Transport directly at (954) 839-8629. 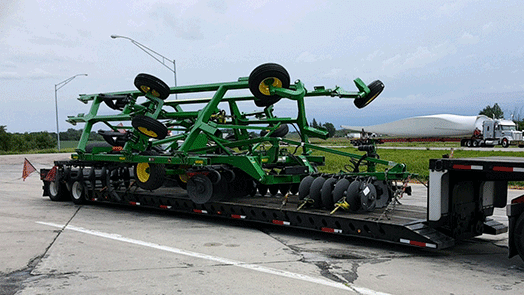 Tractor Transport recently hauled this John Deere 9770 Combine more than 600 miles on a lowboy RGN trailer. Since the combine was overheight at 13 feet tall, the lowboy provided extra clearance to avoid another oversize permit. To ship your farm combine anywhere in the US, Canada or Mexico, call Tye at Tractor Transport directly at (954) 839-8629. This is a John Deere 9600 Combine we transported for one of our clients. 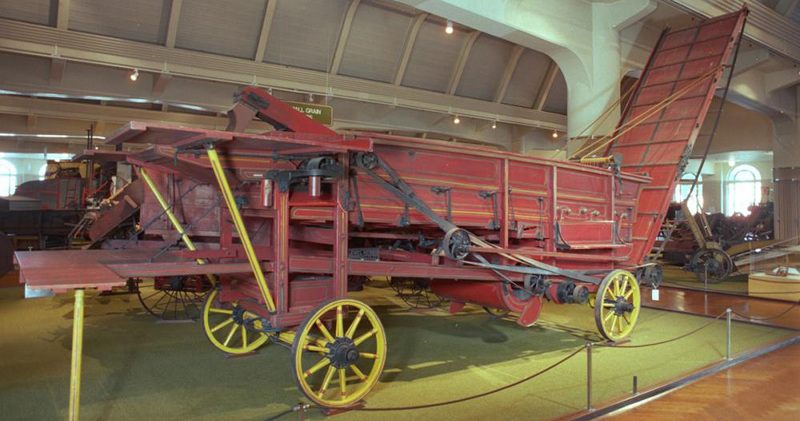 This John Deere was 24 feet long, 12 feet wide, 12 feet high and 26,800 pounds. We pick this Combine up in Bridgeton, NJ and shipped it to Laredo, TX. This haul did require permits because it was over legal dimensions. Schedule your next Combine shipment with our agent Eddie at Tractor Transport! (727) 232-0105. 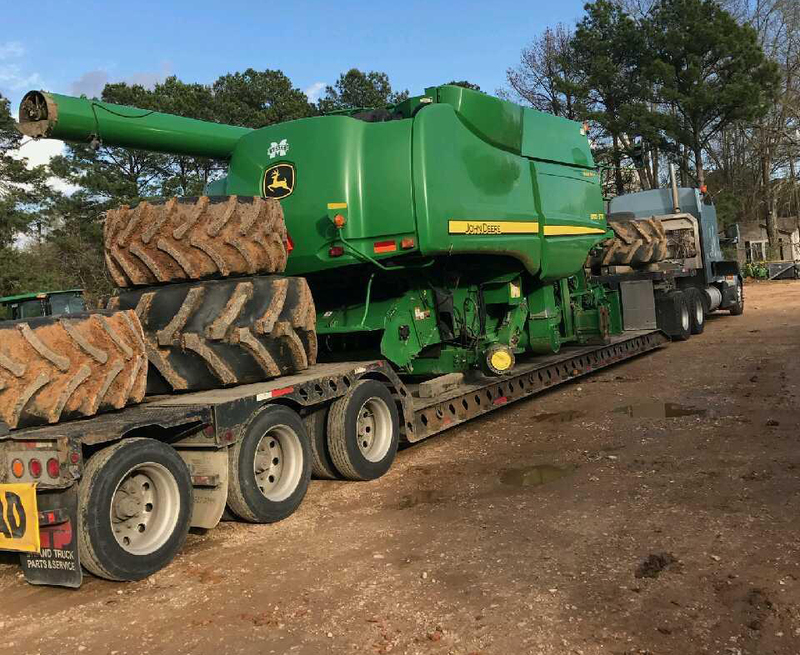 Tractor Transport recently shipped this John Deere S670 Combine from Louisiana. 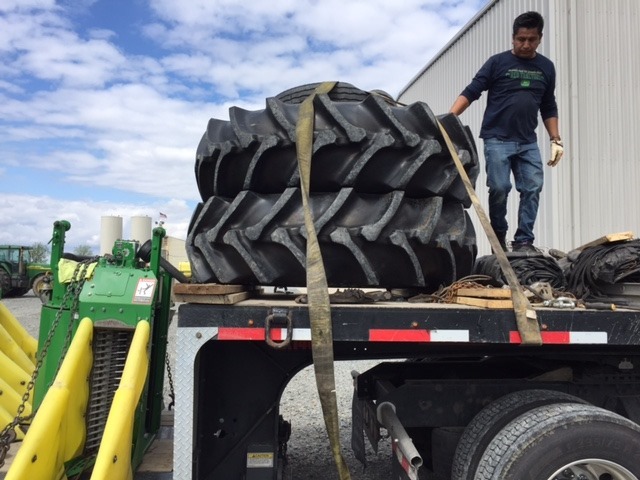 Even though the tires were removed to reduce the width of the shipment, the machine had to travel as an oversize load. To transport your oversize combine anywhere in the US, Canada or Mexico, call Tye at Tractor Transport directly at (954) 839-8629. 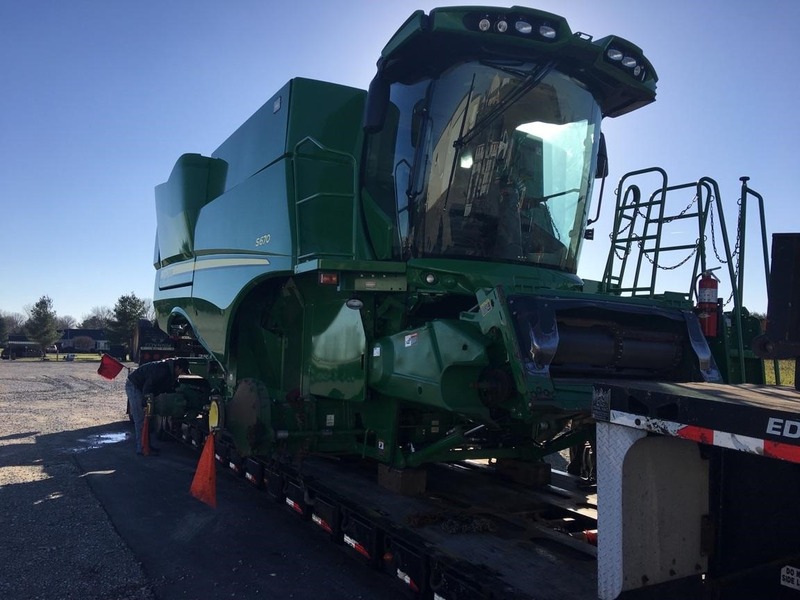 Tractor Transport recently transported this John Deere S670 Combine to a new workplace in Kansas. 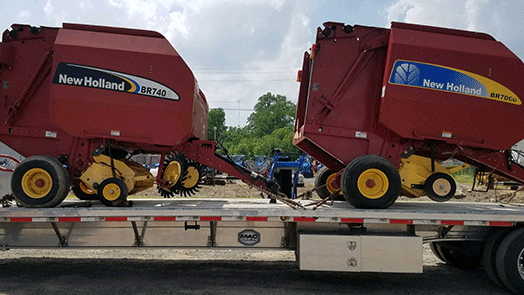 The combine traveled on an RGN trailer with its wheels off for less width of transport. 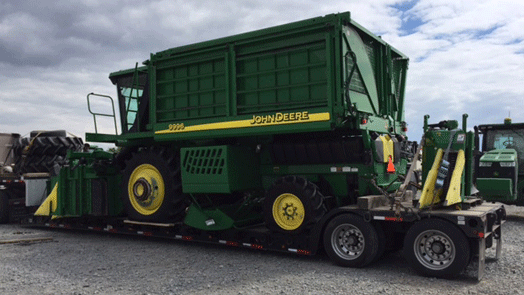 To transport your John Deere combine to its next workstation call Tye at Tractor Transport directly at (954) 839-8629. 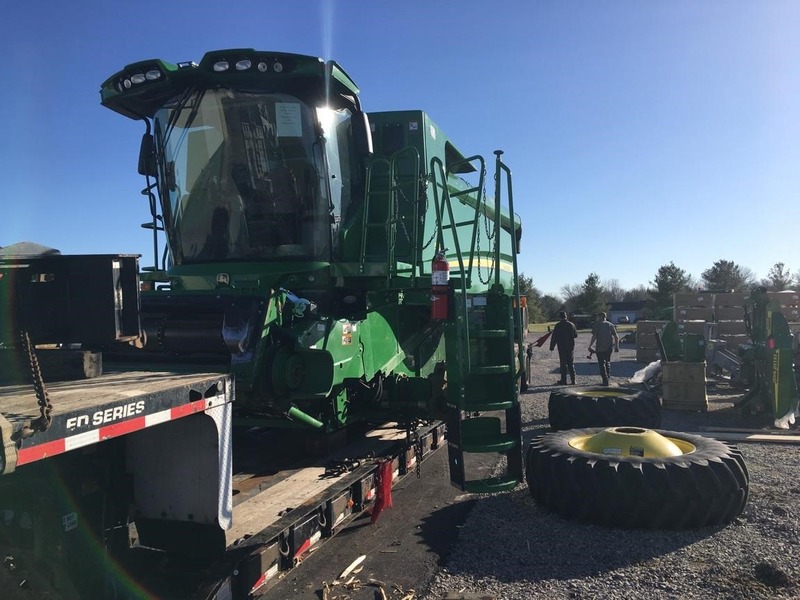 Tractor Transport recently transported this 2014 John Deere S670 Combine from Poseyville, Indiana, to Pittsburg, Kansas. The trip was nearly 500 miles long. Weight: 41,000 pounds. Length: 34 feet. Width: 12 feet 10 inches. Height: 12 feet 10 inches. To transport your oversize combine anywhere in the US, Canada or Mexico, call Tye at Tractor Transport directly at (954) 839-8629. 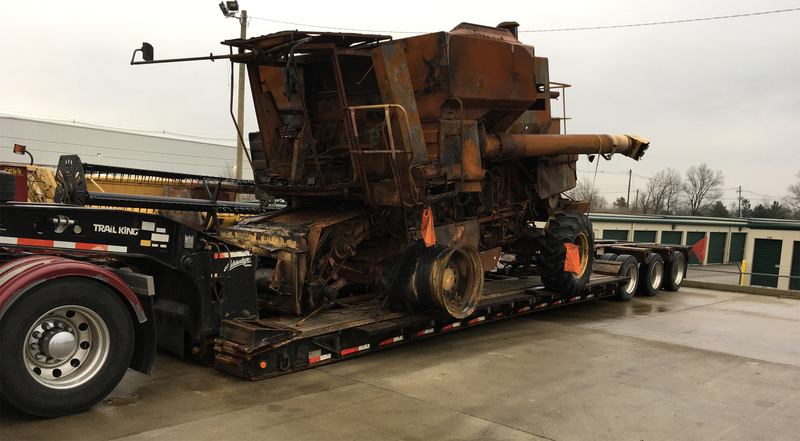 Heavy Haulers recently transported this inoperable combine from North Dakota to Michigan. It looks like an International Harvester combine that sustained fire damage. Weight: 18,000 pounds. Length: 26 feet. Width: 11 feet 8 inches. Height: 11 feet 8 inches. 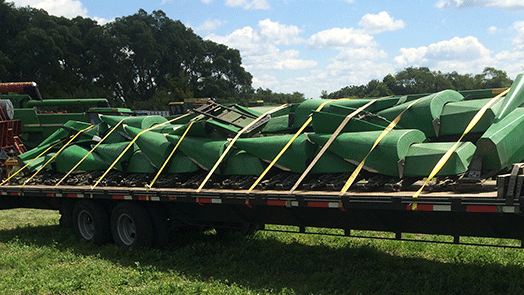 To haul your inoperable combine to its next workstation, call Tye at Tractor Transport directly at (954) 839-8629. Combine harvesters are self-propelled machines used to cut crops (reap), loosen grain from their outer covering (thresh) and separate grains from their outer covering (winnow). All three actions occur with just one pass of the machine. Most modern combines employ rotating cylinders that work the crops. Removable heads are styled for the type of crop to be harvested. 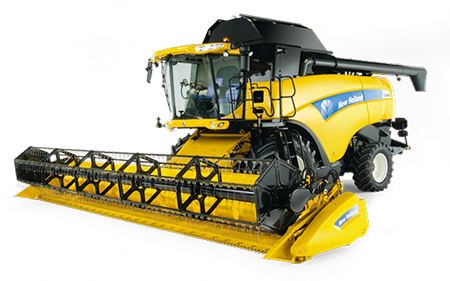 Combine harvesters are used to harvest wheat, oats, barley, rye, corn and soybeans, among others. Select Tractor Transport to ship your farm combine. Farm combines routinely ship as oversize loads. Width and height limits are 8 ½ feet in most states. Most combines easily surpass those limits. 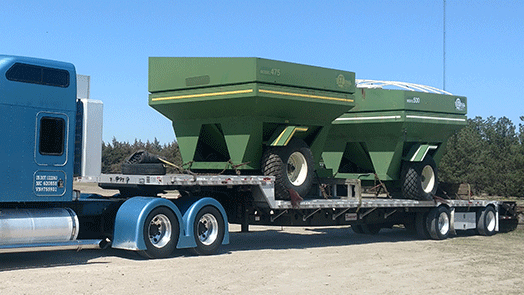 RGN trailers with outriggers are the most popular choice for shipping combines. Lower the neck on the trailer to drive your combine on board the outriggers, which extend outside the frame of the trailer. You gain a foot or two of clearance from and RGN trailer. If your combine stands too tall on an RGN, you’ll need to remove the wheels.